In July 1996, Comedy Central launched a brand new, half-hour news satire and talk show hybrid called The Daily Show, originally hosted by former ESPN anchor Craig Kilborn. Whatever hopes the basic cable network had for the series back then, it is safe to say that The Daily Show far exceeded them. Twenty years later, the show is still one of Comedy Central’s flagships, and has had a profound effect on comedy, television, and politics. 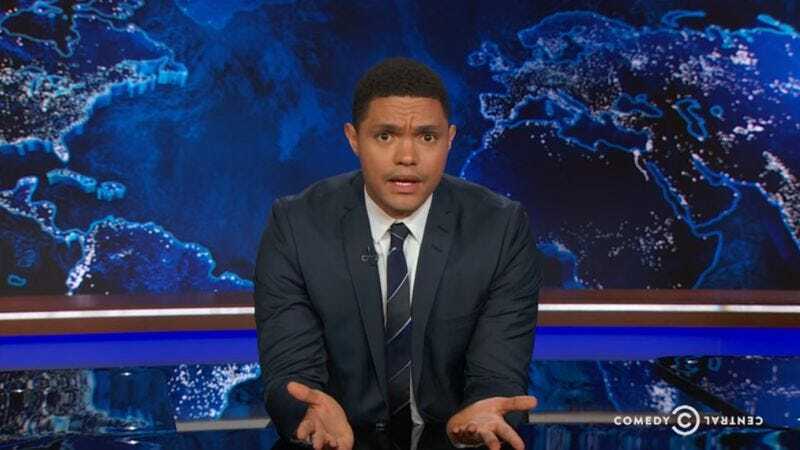 The show is on its third anchor, Trevor Noah, and dozens of correspondents and commentators have come and gone over the last two decades. But there is at least one element of the show, other than its title and basic format, that has survived: the theme song. For 20 years, The Daily Show has kicked off each episode with a rousing rendition of “Dog On Fire,” an instrumental composition by Bob Mould of Hüsker Dü. Mould’s own recording was used during Kilborn’s tenure. When Jon Stewart took over as host in 1998, a new recording of “Dog On Fire” by They Might Be Giants was adopted. When Noah became host, the song was remixed by Timbaland. Now, to celebrate The Daily Show’s 20th anniversary, Todd Van Luling of The Huffington Post has the story of how “Dog On Fire” came to be the show’s anthem. This particular “Dog” was very nearly an orphan, it turns out. The song was originally intended for Mould’s self-titled album, also released in 1996, but was scrapped. When the creators of The Daily Show asked Mould for a theme song, he sent along two of his unused tracks, including “Dog On Fire.” Audio engineer Jim Wilson gave the instrumental its bizarre title, based on an offhand comment Mould had made during an interview. “It has always made me chuckle seeing that name scrolling past during the closing credits of the show,” Wilson says now. “Pretty ridiculous, really!” In any event, the song has been very kind to Mould, providing him with royalties for two decades now.